City authorities in Chongqing have introduced a 30 metre ‘cellphone lane’ for pedestrians – is it a step too far in the name of public safety? 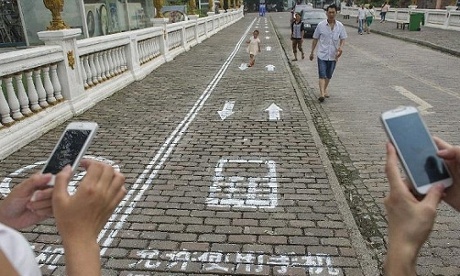 Mind your step: The mobile phone lane for pedestrians in Chongqing, China. In Chongqing, China, with a degree of seriousness that has yet to be determined, the city authorities have designated a 30 metre (100ft) “cellphone lane” for people who use their phones while walking. 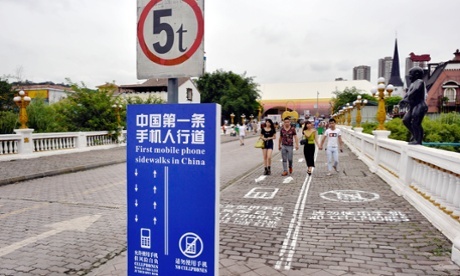 “First mobile phone sidewalks in China,” declares a notice next to it. In fact, the Chongqing phone lane seems to be almost a direct copy of one that was painted on to 18th Street, Washington DC, in July. The Washington version was created for an experiment into crowd behaviour by the National Geographic TV channel. Which is a clue that the seriousness of the Chinese version may be below 100%. The scheme also raises some fairly obvious questions. How will people so distracted by their phones that they are bumping into lampposts manage to stay within the lines of the lane? Even if they do, why will they not bump into each other all the time, or walk straight into the road when the lane finishes? How, for that matter, will they even notice the existence of the lane in the first place? Casual observers of the Washington experiment suggested that many phone-users just ignored it, but perhaps annoying Chinese people will prove more law-abiding than annoying Americans. And yet there does seem to be some pressure building behind the idea that “distracted walking”, as it is known, is a real problem. In 2012, the city of Philadelphia announced what it called an “e-lane” for smartphone users. In fact the pilot scheme turned out to be an April fool, albeit one designed to raise a serious public safety issue. Did these pedestrians in Chongqing notice the sign? In 2013, a study at the Ohio State University found that distracted walking injuries in the US are rising fast, with 1,506 recorded in US emergency rooms in 2010, up from 256 in 2005. The young were especially likely to be affected. Solutions, however, are less straightforward. Stanford University has displayed warning posters around campus. In 2012, the Utah Transit Authority claimed to be seeing real improvements following the introduction of a $50 fine for distracted walking in the vicinity of trains. Just last year the Guardian’s own Oliver Burkeman proposed a campaign of deliberate near misses – a kind of passive-aggressive resistance movement on the part of the well behaved. Eventually perhaps smartwatches might deliver us from the menace of smartphones, by vibrating whenever the wearer is about to crash into something, although that day does not yet seem close. We await news from Chongqing with interest.